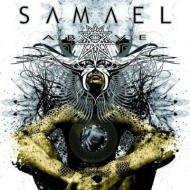 I stuck with SAMAEL longer than most people I know, but after "Passage", the former Swiss black metal heroes lost me with their sardonic drum-machine electro-frippery. I never hated them, but I lost interest, and it's been years since I gave anything but their 1994 masterpiece "Ceremony of Opposites" the time of day. So why even delve into new LP "Alone"? Rumor had it that this was the sound of the band returning to its roots, and since no one pulls off that sneering, mid-paced, haughty and regal black metal aloofness like they did in their prime, it was worth investigating. But understand that "Alone" is a wholly new metamorphosis for SAMAEL. It's black metal, sure, but of a fast, thundering, quasi-symphonic variety unknown in the band's back catalog. The drum machine is still here, recorded at teeth-rattling in-the-red volume, noisily bashing and clattering away any nuances in the sound, with a near-constant jackhammer of a blast beat. When they back off that beat a little bit, even if it's to replace it with an equally speedy thrash polka (see "On the Top of It All", the song gets a little room to breathe and develop its own identity (in this case, a nauseatingly intense, keyboard-laden overdose of driving, insistent "Passage" era industrial metal, with equally loud and overbearing vocals). For the most part, there's scarcely a second to collect one's thoughts as "Above" rains down like a collapsing building. It's actually a pretty cool sound, for a little while at least, with the noise and intensity assaulting the listener and giving no quarter. The big problem is that it's quickly fatiguing, and little is revealed in repeated listens beyond more of the same clangor. The few actual songs that emerge, like "Virtual War", "Black Hole" and "On the Top Of It All", offer a glimpse of how compelling this new SAMAEL vibe could be, but it's quickly back to full-blown bludgeon mode, and the moment is lost (doubly frustrating on a song like "Earth Country", which would have been a dynamic link to their past glories if not for the overdriven production). Add that to some pretty lame lyrics ("God's Snake" is about exactly the appendage you might think it is, for instance) and you've got yourself a shaky and flawed, if somewhat thought-provoking, unholy racket of a record. "Above" may not be a great record, but it's an interesting transitional piece from a band who've lived to confound our expectations for years. I'd be delighted to hear them refine this approach and continue down this path, but knowing SAMAEL, their next step could be more of the same or yet another perplexing musical detour they've not yet tried. At least "Above", despite its weaknesses, has piqued my interest in once again following the band down whatever dark path they choose next.